The much-beloved fictional band A.N.JELL from SBS‘s hit drama ‘You’re Beautiful‘ (minus Jang Geun Suk) reunited once again, much to the delight of fans! On October 7th, Park Shin Hye tweeted a group photo of the A.N.JELL group mates saying, “Tae Kyung hyung-nim (Jang Geun Suk’s character in the drama)~ do you see this~? We are heading over to A.N.JELL’s 2nd year anniversary performance~!! It would be perfect if hyung-nim was here. It’s so unfortunate ㅠㅡㅠ“. Hongki later responded to the photo with the tweet, “I think I got too close to the camera my face looks big! ㅠㅠ”, to which Park Shin Hye replied, “Jeremy~ Your face doesn’t look big at all~ Is our first broadcast tonight at 10~? ?”, sparking the curiosity of fans. October 7 2011 was the 2nd anniversary of drama You're Beautiful, marking the 2nd year since the 1st broadcast of the phenomenal drama series which created a Hallyu wave worldwide. What a wonderful feeling last night seeing the picture of them together on twitter. I love the anjells and their friendship and i hope that they remain friends forever. I'm happier though seeing YH and shinhye together as we all know that among the Anjells, YH was the busiest and had no time to hang out. I'm an Anjell and a Dooley fan combined..Kamsamhamnida, Anjells..Saranghae.. The movie that curved so many smiles in my heart..made me realize that age can stand still..be beautiful and be in love. The Characters showed me a new dimension of affection..my heart traveled in time to be young and Beautiful. JGS became my Facebook OPPA.. Daily for 1 yr I posted his pix, some video on you tube on occasions. I am an avid FAN of JGS but all 4 has a soft spot in my heart. After which I became Korean..many Dramas more I've watched..deeper and better..BUT in my heart YOU'RE BEAUTIFUL is irreplaceable..
Heartstrings is a dream come true. Hoping Jeremy gets his chance to redeem his love for Gominam in a drama, After all his Love was greatest among the 3, as he started loving Minama as a MAN, forgetting all odds. Gomawa for making me young.. Kamsahamnida for the loving feelings..SARANGHAMNIDA ANJELL.. Bogoshipda..Oppa JGS Saranghe. Make it happen please...Season 2 3 4 ..All for the sake of Beautiful Drama that turns Immortal in our hearts...it's beyond forgetting. I LIKE THIS MOVIE FOREVER...AND LOVE..LOVE...LOVE...VERY MUCH MY IDOL..PARK SHIN HYE...!!!!!!!!!!!!!!!!!!! i totally LOVE this picture...i sooooooooooo miss YB and the ANJELLs!!! if only we can get a second season!!! they have such great friendship!!! i love YAB!!! Jeremy super love love love.... so cute seeing these people have time to see each other even all of them are busy.... friendship really makes it!!!! Just finished my nth time watching over again YB (when I read this article). Each time never fails to light my mood, inlove and inspire. 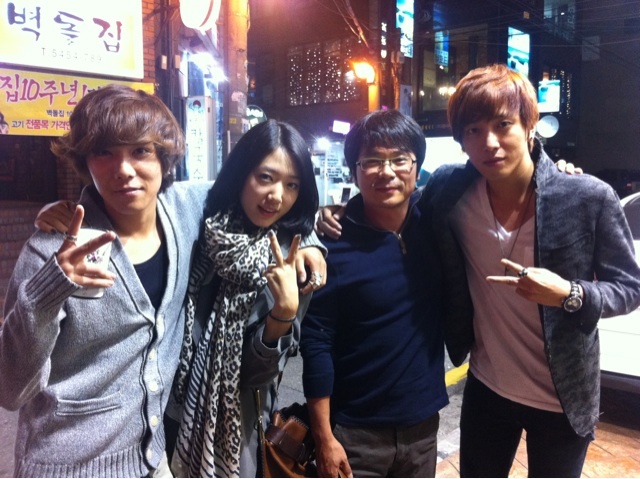 I like to see Jung Yong Hwa & Park Shin Hye..They are very cute together..
i hope there's part 2 of hb or another drama that the four of them are the main casts.i really loved them together.i really hope that they reunite once again in one drama..^^ god bless and more power!^^ daebak! i really loved the drama, we are all begging for a 2nd season, with the ammount of fame it has now i don't see why you guys don't make more seasons. I am from South Africa and I know many fans here who love the series. they actors really do have good chemistry.